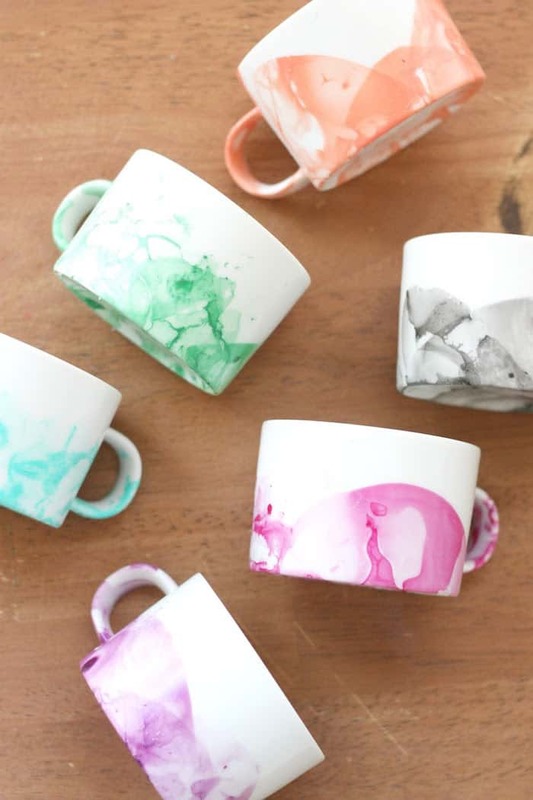 Did you know you can make cool marbled mugs with nail polish? It’s easy and you can have gorgeous gifts in minutes. These DIY nail polish mugs cost LESS than a dollar each! Scroll down to the bottom of the post to see a video of the process in action. You’re going to have a great time. I am SO excited to share this DIY mug decorating project with you, friends! I have been seeing the marbling trend all over Pinterest lately and finally succumbed to e-peer pressure; I tried some nail polish mugs for myself over the weekend. I was so inspired by this gorgeous post where Jan marbled mugs, and decided I had to start there! The best thing about these nail polish mugs is that they only costs a couple of dollars to make – and even less time to finish. I found my mugs for $.79 each at Goodwill and used nail polish I already had at home which means I was able to make 6 nail polish mugs for less than $5! A DIY mug is a steal with a BIG payoff. Plus, I’m obsessed with the outcome. Are Nail Polish Mugs Dishwasher Safe? No, not right out of the gate, you can’t wash them in the dishwasher nor should you microwave them. Baking them only darkens the nail polish (sometimes to a color that is very unappealing) so don’t bother with that either. These are meant to be hand wash only – but you can seal them with Mod Podge. 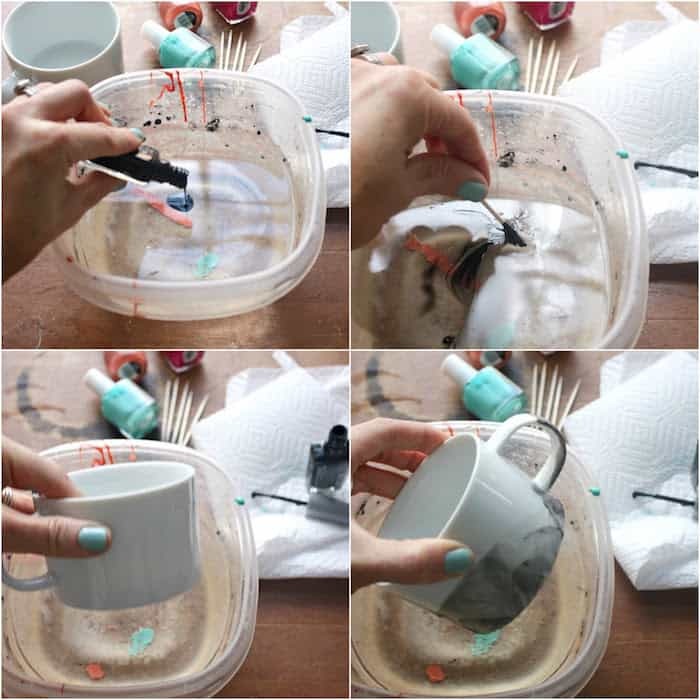 If you’ve never tried Dishwasher Safe Mod Podge, this is the best way to seal your mugs. You’ll just paint the mug with the formula, and then let it cure for 28 days. This doesn’t mean you can’t use it, but you shouldn’t wash it for that time frame (rinsing out is fine). The Mod Podge will extend the life of your mug. I still recommend hand washing even after using the Dishwasher Safe Mod Podge. You can try the top rack of your dishwasher, but the nail polish will still wear down just because it’s always going to be slightly fragile. That doesn’t mean a DIY mug like this isn’t worth it, but it’s something you need to consider! Tip: using Mod Podge doesn’t mean you can microwave your mug. That is still a no-no. 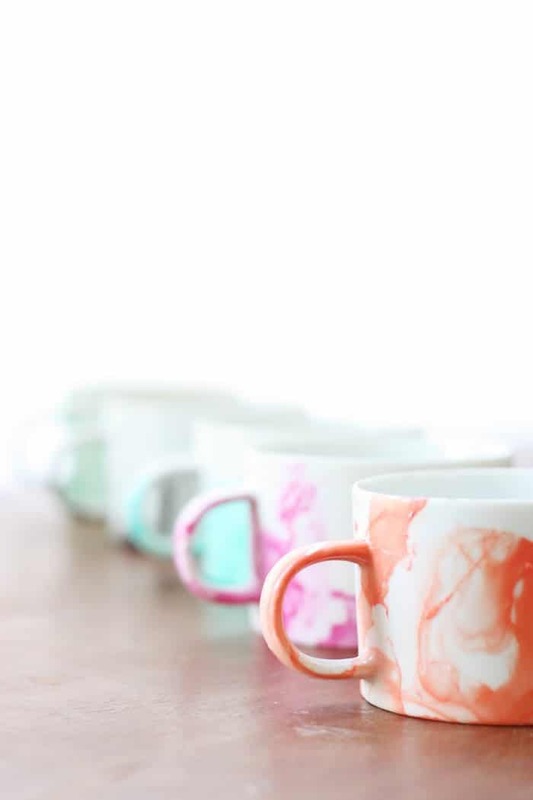 If you’re ready to try this DIY – here’s how you make these marbled mugs! Step One: Fill your container halfway with hot water. The hotter the better! Once the nail polish touches the water it is going to want to set and heat will slow the process. Step Three: Quickly use your toothpick to swirl the polish around in the water. Step Four: Dip your mug in the water! The process is soooo fast once the polish touches the water so you’ll want to move quickly. Step Five: Place your DIY mug on a paper towel to dry, top down. Step Six (optional): Use nail polish remover to take the excess polish off the bottom of the mug. Let dry overnight before using. 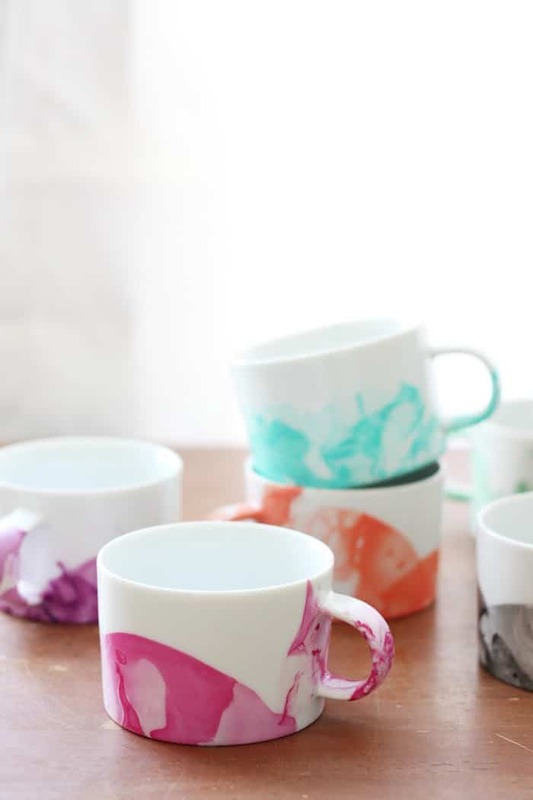 Just like that you’ve got some one-of-a-kind nail polish mugs! Remember, these are not dishwasher or microwave safe so you’ll want to wash them by hand, and you know, not microwave them. When dipping your marbled mugs, it’s best to only dip them on the mug below your lip line, at least on one side, for your health. 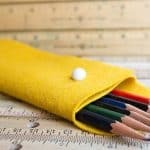 Get all your supplies ready so that you can work quickly. The hot water will keep the nail polish from drying too quickly, but you’ll still need to move fast. Spread your nail polish over the surface of the water CLOSE to the water. If you pour it from above, it’s going to clump. This will cause clumps on your mugs. Use a toothpick to mix the colors together if you want to get creative and mix multiple polishes. Pour the polishes in various areas (not all together), and spread out thoroughly over the surface of the water. 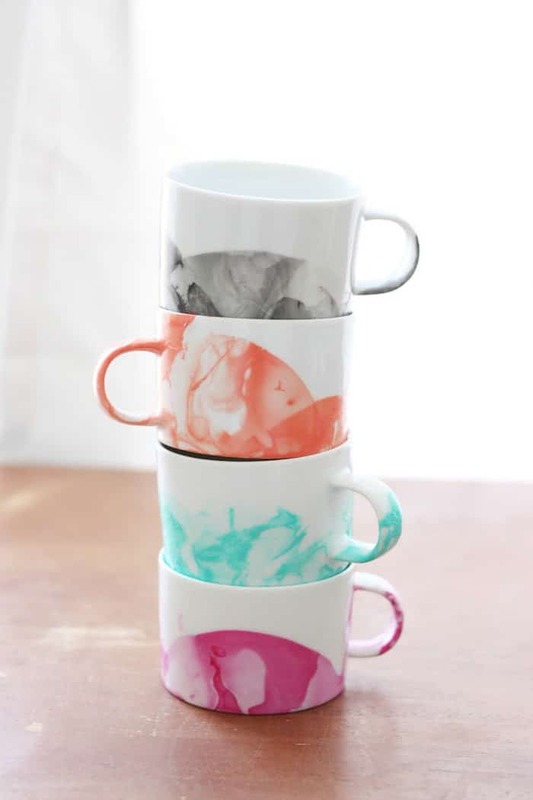 Aren’t these nail polish mugs gorgeous? I’m obsessed with thinking about all of the things I can marble and all of the color combinations I could make them with. Making a DIY mug is such a piece of cake, you’d be nuts not to give it a try. 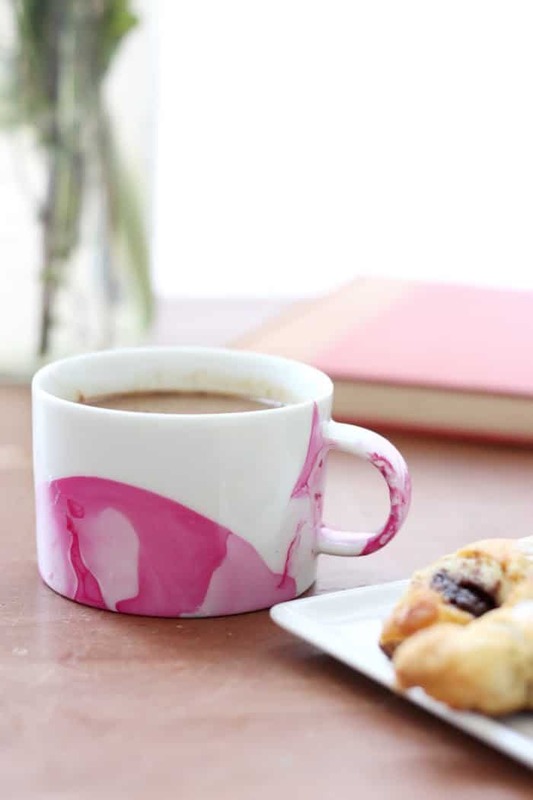 If you’re ready for more, learn to decorate mugs 10 ways. Just click on the image below! do you think sealing the mugs with something would be a good idea? You can do it to extend the life – try Dishwasher Safe Mod Podge over the top! I’ve been seeing this all over pinterest too and was wondering if it was worth a shot! I have a few white mugs as well that i’d like to decorate, and of course some nail polish laying around! yours look fantastic! i can’t wait to experiment with some different colors like you! love this post, thank you! That’s what I thought also, but I could never get the project to work. My nail polish would just clump in the water. I tried so many different brands of nail polish & none of them worked. At least my daughter-in-law & granddaughter are now enjoying all the different colored nail polishes I bought for this project that didn’t work. Good luck. If anyone has any hints as to why my attempt didn’t work – I’m open to suggestions. Hate it when a craft doesn’t work as it is directed to. When I did this, I found that once you dip your mug, any polish remaining on the water will “set” and not allow any new polish to be fluid enough to marble. Once you dip a mug, I recommend using a paper towel to remove any excess polish that might be in/on the water. Just lay the paper towel over the entire surface of the water, then lift up. The paper towel will “catch” all remaining polish, leaving a clean surface. Also, make sure you keep your water warm or hot (not scalding hot) as mentioned in the instruction. As long as you don’t touch an area with nail polish to your lips, you’re fine. It’s like painting a mug with ceramic paint! And in terms of the sharpie, I’m not sure if you could do it over the nail polish. It’s worth a try! Grab a dollar store mug to do an inexpensive test (and watch it closely in the oven). i was also wondering the same but something a little different; i didn’t read that you can’t do it over lip line, and i would like to use these mugs when people come over. Can you bake them and then be able to drink from them ? please let me know! doing this for mother’s day present! Michelle are you meaning with the nail polish? I have heard you cannot bake the nail polish. You can bake the mugs. I put the oven on 300 and let them bake for 15-20 minutes!! its really awesome…… i will definitely try it!! I just did this and love the way it turned out. Buuuut when does it stop smelling!!!! The mug smells like nail polish so bad I don’t think I can even use it! ? Shana I’m sensitive to smells too – place it in an area that it won’t bother you as it airs out and cures. Garage, outside (if it’s not too cold), even closet? Do you know where I can find these exact mugs or at least the same brand? Hi Brianna! These were thrift store finds! Oh my gosh! This worked so well for me! I suggest using bright colors because I tried one with light purple and it didn’t come out. But other than that it works amazing! Thanks for the tutorial! Can you do more then one color? Yes, I did three, and it looked wonderful! i was just wondering if there is anything i can do to make it microwave safe? I made some last year and put them in the microwave all the time. No problem. To take care of the smell… I baked the mugs at low heat in my oven for a few hours. Once they were good and dry, the odor stopped. When I got tired of the designs, I started washing them in the dishwasher until the nail polish came off and I’m ready to do again. Fun project. Total bust!..I just tried doing this myself and it didn’t work. I even tried a bunch of different brands of nail polish and none of them worked. There was an oil that would appear around the nail polish in the water and make it impossible to swirl with a toothpick or do anything with. Very disappointed. I did it this morning and it worked beautifully. I was very pleased. i had the same problem. i tried for so long to marble stuff and it never worked out for me, until i figured out that you need warm to hot water with a more liquidy nail polish. The best nail polishes i found to work were the sinful colors brand; and for spreading them.. i just blew on the nail polish in the water. i tried the toothpicks and the nail polish kept sticking to my toothpick and lifting out of the water. This would be good crafts for my 12 year old granddaughter to go with Starbucks themed party. T_____T i’ve tried twice and it was a mess. 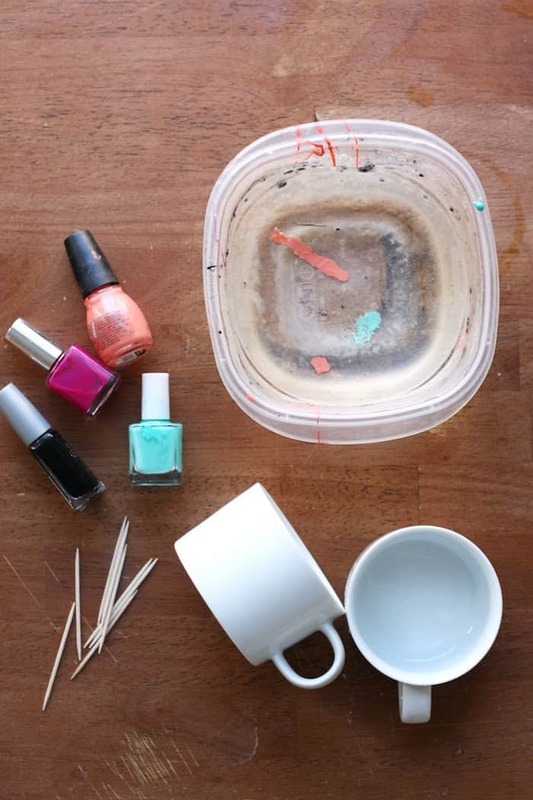 The nail polish becomes heavy drops of ink and sticks to the mug and the water recipient. Do you know why? Sounds like you might need to try with a few? I’ve found the cheaper brands work better as long as they are not quick dry! Sorry, it did not work for me. Though I used very hot water, nail paint just did not spread. 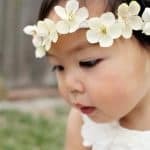 Can you suggest a brand available in Australia ? Hi there! Thanks for the idea. I’d like to ask if the nail polish would be removed if I constantly wash the cup, please, waiting for yourr response. Thanks! Hi Carolina! We recommend hand washing OR using Dishwasher Safe Mod Podge over the top 😀 Thank you!